8 May, 1945 saw Victory in Europe Day festivities across the continent and overseas. While the Second World War would only end with the defeat of Japan in September, and though a steep climb to recovery faced the countries involved, the desperately-awaited occasion was marked with wild festivities. VE Day celebrations in Trafalgar Square, London. Note the pair of shoes I mistook for a head, because one man is upside-down. Photograph from Lieutenant Arthur L. Cole, Library and Archives Canada. Dancing, parades, and street parties took place throughout Britain, with makeshift community feasts pulled together from rationed goods and home-grown produce. The people had become experts at making the most of little thanks to practices put in place by the government from the very outbreak of war. Added to this was a range of posters, films, and leaflets which helped to cultivate thrifty attitudes crucial to the nation’s wartime success. Seventy years on, I thought it would be worth taking a look back at some of the slogans and artwork created to help get Britain frugal with food. Designed by Mary Tunbridge. Taken from a joint public domain collection by The National Archives and Wikimedia Commons. Before the war, Britain’s food imports numbered 22 million tonnes. If it helps with visualisation, that’s 122,222 blue whales’ worth of food (taking the weight of a large blue whale to be around 180 tonnes). N.B. Do not go around informing your friends that food imports in 1930s Britain consisted of 122,222 blue whales. Enemy threats to trading routes at sea and occupation of partner countries, as well as British prioritisation of ships for military use, began to put Fall a strain on supplies. Nationwide rationing of imported goods came into effect from January 1940 with initial limits on sugar, butter, and bacon (not surprisingly, that last decision was considerably unpopular). Designed by Peter Fraser. The National Archives / Wikimedia Commons. Following the failed Grow More Food campaign of October 1939 was Dig for Victory. Fronted by Minister of Food, Lord Woolton, it was guided and organised by John Raeburn, Head of Agricultural Plans. The slogan was apparently a coinage of Evening Standard journalist Michael Foot, later leader of the Labour Party in 1980. Appearing on some 10 million leaflets sent out during the period (take a look at this example from the British Library), it was most famously seen with iStopMotion the well-known ‘boot-on-spade’ photograph, which went on to become a symbol of the campaign and featured in miniature on other posters. The famous ‘boot-on-spade’ image, courtesy of the World Carrot Museum. Dig! Dig Dig! for Victory! The ultimate result was a staggering display of individual and collective drive. More and more people took to producing their own fruits and vegetables, with the number of allotments soaring from 815,000 to 1,400,000. Many open areas were New transformed into plots, including the Tower of London moat. According to the calculations of writer Daniel Smith in The Spade as Mighty as the Sword, this meant that the annual production of vegetables by 1943 was above one million tonnes (or 5,556 blue whales’ worth, according to mine). That new slogan was Dig for Plenty, which had already been circulating in 1944. Artist unknown, possibly ‘Le Bon’. The National Archives / Wikimedia Commons. Gloriously bright colours and images of plenty were signs of a fruitful future that lay in the public’s hardworking hands. Artist unknown, possibly ‘Ban’. Note the ‘boot-on-spade’ symbol both on this poster and the one before. The National Archives / Wikimedia Commons. Image and text from the Local Studies collection, The Forum, Southend-on-Sea. With thanks to Carole Shorney and the South East Essex Organic Gardeners. Similar to Dig for Victory was Lend a Hand on the Land, which specifically targeted city dwellers to help with farm-based food production efforts during their holidays. Artist unknown, possibly ‘Showell’. The National Archives / Wikimedia Commons. Artist unknown, possibly ‘Nunney’. The National Archives / Wikimedia Commons. Highlighting the personal benefits of farm work was another tactic. In this Ministry of Information short film from 1944 – 1945, lending a hand is shown to make for a productive holiday away from the stress of office work, all while keeping an individual in shape. Note also the sneaky use of alcohol to advertise happiness (from 00:43 9?????????????????????????? onwards). Shown being handed a drink, the man recalls, ‘Yes, life was very satisfying.’ Lending a Hand = Holiday + Free Beer? Winning. Designed by Eileen Evans. The National Archives / Wikimedia Commons. As with Dig for Victory, the Lend a Hand campaign continued after the war, as in this entertaining wholesale NFL jerseys potato digging film from 1946, played on rewind. Potato production in particular soared from 208,447 hectares in 1940 to 329,540 hectares in 1950. Going by FIFA’s current dimensions, that’s a rise from 252,663 to 399,442 full-sized international football pitches, one being 0.825 hectares. Overall, there was a 50% increase in the area of British arable farmland during the World War Two period. Image courtesy of Flickr user jocki84. These were created as part of the Dig for Victory campaign. Potato Pete came first, complete with recipe books – those devilled potatoes on page ten caught my stomach’s attention! Of course, there were also songs. Have a listen to this toe-tapper by Betty Driver (starting at 01:52). With more wheat being put aside for the armed forces, potatoes provided a high-energy alternative which was also a source of Vitamin C.
Doctor Carrot followed in November 1941, encouraging the public to eat more of the orange vegetables. 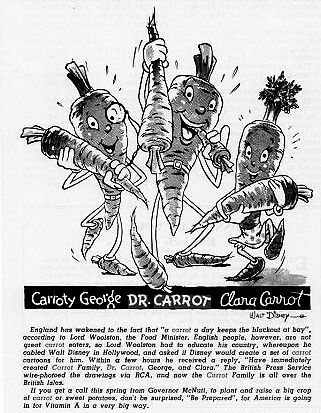 Disney also appears to have helped Lord Woolton achieve this task, with cartoonist Hank Porter creating a carrot family that featured on published material. By 1942, Britain had a surplus. The Disney Carrot Family. ‘Dr. Carrot’ was later changed to ‘Pops Carrot’ to avoid clashing with the British Doctor Carrot. Image courtesy of the World Carrot Museum. Contributing towards general eye health, they were also believed to give consumers powers of night vision. According to the World Carrot Museum, such a belief was spread by the British Government telling the public that RAF pilots succeeded in night-time battles due to their heightened vision from carrot consumption. This inspired people to eat surplus produce and also provided cover for the real source of night vision: a secretly developed radar system built into fighter planes. Carrots were slipped into meals throughout the day and sometimes took the place of sweets, which were on ration. They were also combined with potatoes and other vegetables to make the meat-free Savoy Hotel invention Woolton Pie, which was named after the Ministry of Food chief. The World Carrot Museum has a full list of recipes, including one for an intriguing Carrot Fudge. Food waste was punishable by law from as early as 1940 onwards and every effort was made to recycle as much as possible. One notable use of kitchen waste was feeding pigs, which were reared in the hundreds of ‘pig clubs’ set up by people around the country, wholesale MLB jerseys as well as on farms. Designed by John Gilroy. The National Archives / Wikimedia Commons. Leftover bones were especially useful, providing grease Promotion for planes and a source of glue. Designed by Cyril Kenneth Bird (also known as Fougasse). The National Archives / Wikimedia Commons. Second World War recycling know-how could certainly be applied today. 7.2 million tonnes of food and drink is wasted per year in the United Kingdom, according to a 2013 report. I see 40,000 blue whales, all shaking their heads at us in disappointment.